Todays guest post is from my all time favorite favorite foraging book, The Flavors of Home. This amazing book, written by Margit-Roos Collins, is my go to on foraging for wild edibles in The Bay, and I highly recommend it to anyone who wants to learn about what nature has to offer in our area (I like it so much I even wrote the forward for the new edition!). Check out her post below and make sure to click the link at the bottom to get a copy of your own with a special discount. Some edible wild plants are hard to find. Not pickleweed. You will find lush stands of it at virtually every marsh that borders bay or ocean waters in this area. In winter and early spring, the plants stay brown even though the surrounding hills are covered in fresh grass. Then in April and May, pickleweed comes into its own. The new growth appears, rejuvenating the marshes with fresh green. Just about the time that your favorite leafy spring greens are becoming too mature to be tasty, the prime season for pickleweed foraging begins. Pickleweed looks unusual, so it is easy to identify. Each plant consists of round, branching stems that are divided by joints into individual segments. The leaves and flowers are so tiny that you will probably never notice them. The plants look simple, tidy, and primitive. This plant's story is bittersweet. A salt marsh is a difficult environment; such concentrations of salt would kill most land plants. Pickleweed dominates large areas of marsh here and on other continents because its succulent tissues can store up water in the spring, when rain runoff reduces the saltiness of the marsh. The plant then uses that stored, relatively fresh water through the summer growing season. Its tissues can also withstand an internal salt level that is much higher than most species could bear (whereas some other salt-marsh species have special mechanisms for excreting the salt). So, at first glance, the plant appears to be a standard ecological success story: adapt to a unique niche and thrive. The truth is more poignant. Scientists who grew some pickleweed in soil dryer than its normal marsh setting found that it grew faster and better than normal. And the less salty the water they gave it, the more it thrived. It appears that pickleweed would "love" to be a normal dry-land plant, but something in its makeup renders it unable to compete with dry-land species. So it survived by adapting to a hostile setting that its competitors could not tolerate. The cost of the adaptation is that individual plants never grow as luxuriantly as they could if pickleweed had evolved a way to compete directly with the rain-watered land species. The science of plant ecology is still so young and primitive that we are unaccustomed to feeling tenderness for the hardships of plants, for the drama of their lost potential. For most plant species, we don 't yet have a clue about the nature of those hardships and trade-offs. As we learn more about other species' mechanisms for survival, surely some of the false distance and sentimentality that many feel toward the plant kingdom will ebb, replaced by greater intimacy and identification. What do you do with a harvest of these odd-looking, jointed stems? Refrigerate it in an airtight bag or container, just as you would any green vegetable. It will stay fresh for three weeks or longer. I ignored some in my refrigerator that long and they tasted fine when I finally got up the courage to prepare them. Eaten by itself, raw, it is too salty for my taste, even when it is well washed. However, pickleweed can contribute attractive looks and refined flavor to a salad. My husband and I ate it with lettuce, avocado, scallions, tomatoes, and fresh raw peas. Like the peas, it was slightly bitter and slightly sweet. The pickleweed also tasted a bit sour. We didn't add any salt to the oil and vinegar dressing, since pickleweed contains so much. That way, its saltiness was not a problem and, in fact, tasted good in combination with all the other vegetables. As you have probably guessed from its name, pickleweed is good pickled as well as fresh. It has been gathered for that purpose from the marshes of northern Europe for centuries. Most of the pickleweed pickle recipes given in books are similar to each other. The recipe given here is a modified version. If you decide to use an entirely different pickling recipe, adapted for cucumbers and the like, skip the brining step. Pickleweed amply reflects its own briny origins. Making these pickles is fun and simple. And they are pretty! A wedge of ordinary cucumber pickle looks dull compared with the delicate, branching shape of pickleweed and its clear, dark green color. As for flavor, pickleweed pickles taste much like any sweet pickles. The pickleweed's own flavor is completely masked by the pleasing combination of pickling spices, vinegar, onion, and sugar. You can alter the flavor to your taste by reducing or omitting the sugar or by adding bay leaves or other seasonings. Boil the mixture for 10 minutes. Meanwhile, wash the pickleweed, and wash and rinse your jars, lids, and rims very well. Just before the 10 minutes are up, rinse the jars in hot water and pack the pickleweed into them so that the leaves stand vertically. Pour the vinegar mixture boiling hot over the pickleweed, filling the jars to the rim. Immediately put on the metal lids and screw them down tightly. When the jars have cooled, test them for a vacuum by pressing on the lids. If the lids do not give under your fingers, the jars are vacuum sealed. Store them for at least three weeks in a dry place out of direct sunlight, and then the pickles will be ready to eat. Try them on open-face sandwiches, since their shape and color are so attractive. If the metal lid clicks down and up as you press and release it, the vacuum did not form and the pickles will spoil if left on a shelf. (A vacuum denies bacteria the oxygen they need to decompose food.) Put that jar in the refrigerator. You can still enjoy that batch in salads, especially in seafood or chicken salad. Making pickles is one of the most relaxing types of canning because the dread botulinus toxin can't grow in such strongly acidic foods. Some people like to dilute the vinegar in pickle recipes with water to make a milder pickle. That's fine, but take care that at least half of the pickling liquid is always vinegar. As long as the mixture is at least 50 percent vinegar, it will be completely safe. Gathering pickleweed is satisfying in part because you can snap each piece off neatly at a joint, leaving little trace of your action. Because the stems snap off so easily, walking through a stand of pickleweed leaves an ugly trail of broken plants. If you harvest from the edge of a patch, your work can be invisible. This plant really is a delight. If you make pickles in the spring, they 'll be ready in time for all the salads, sandwiches, and elegant cold dishes of summer. And come June and July, if you itch to bring home some wild green tidbit, pickleweed will be one of the few still in its prime. That's a great time to head for a marsh and savor its lushness, within sight of the tawny, dry hills. The best time to gather pickleweed is from April through July, although you may find the tips green and succulent earlier or later, depending on the marsh. For example, at Grizzly Island, large areas are kept flooded until late in the spring. The new year's growth tends not to develop until May. However, the pickleweed in those fields will still be lushly green through August, whereas the stands in less-managed marshes will be drying out by mid-July. In autumn, pickleweed has more to offer your eyes than your tastebuds. As it dries, it takes on new tones, coloring the marshes with broad sweeps of deep red and purple. Pickleweed grows in most, if not all, of the brackish or salt-water marshes around the Bay Area. Some of these marshes are small, heavily visited, and thus not good places to forage. Some may be too polluted. Others are clean enough and well able to spare some pickleweed stems. Use your judgment and follow the posted regulations or talk with a ranger. You can enjoy pickleweed's beautiful autumn colors in any of these spots. The health benefits of eating seaweed are widely known, but that’s not the only reason to get your hands on some. Have you ever heard of Turkish bath towel? This red seaweed is unique in both appearance and the ways to use it! As you can see, Turkish towel has a bumpy texture. 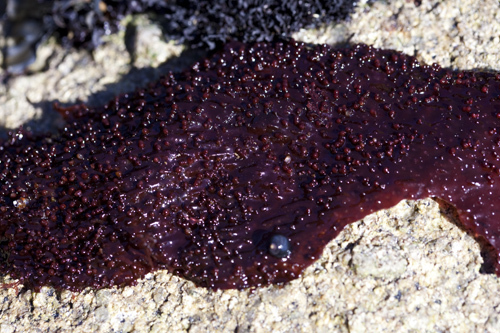 Actually, the seaweed’s reproductive organs cause these swellings to form on its surface. When placed in fresh water, they create a clear jelly, which is often used as a gelling agent for several different types of food. Turkish bath towel’s Latin name is chondracanthus exasperatus, but that’s a bit of a mouthful. It is widely known as the Turkish bath towel because when you touch the rough papillae surface, it feels very similar to a towel from a Turkish bath. Interestingly, the blade thickness of Turkish bath towel is determined by its level of exposure. In more sheltered habitats, the blades are thinner, but in more natural and exposed areas, the blades are thicker and rougher to the touch. The gel within the blades is used as an ingredient in all types of things, including cosmetics. Turkish bath towel can be found right off the coast of California, and its distinct look makes it pretty easy to find! Keep your eyes out for it next time you’re by the water. This seaweed likes to attach to rocks in the low intertidal area. It’s best grown in more exposed areas, as mentioned above. However, it is possible to be air-grown, so long as it is sprayed frequently with sea water. Aside from being an ingredient for cosmetics and different gelling agents, Turkish bath towel has a few other unique uses. For one, as the name suggests, it can be used in baths as a natural exfoliating bath towel. It’s good for the skin, and the texture is perfect to scrub off any unwanted residue. Turkish bath towel is commonly used for thalassotherapy, a form of therapy using seawater and sea products to refresh the skin’s pores by absorbing the potassium, calcium, sodium, iodine, and magnesium found in sea water. Practitioners of thalassotherapy will tell you that Turkish bath towel is most effective for washing when it’s used within the sea that it comes from. That’s not to say that using it in a fresh water bath has no benefits, but harvesting some Turkish bath towel off the coast of California and giving yourself a relaxing wash in the ocean sounds pretty great, doesn’t it? Add that to the many reasons you should harvest your own seaweed! Although Turkish bath towel is not edible, it has so many unique uses. With many seaweeds available in the California area, foraging for seaweed gives you another reason to spend a day by the water! 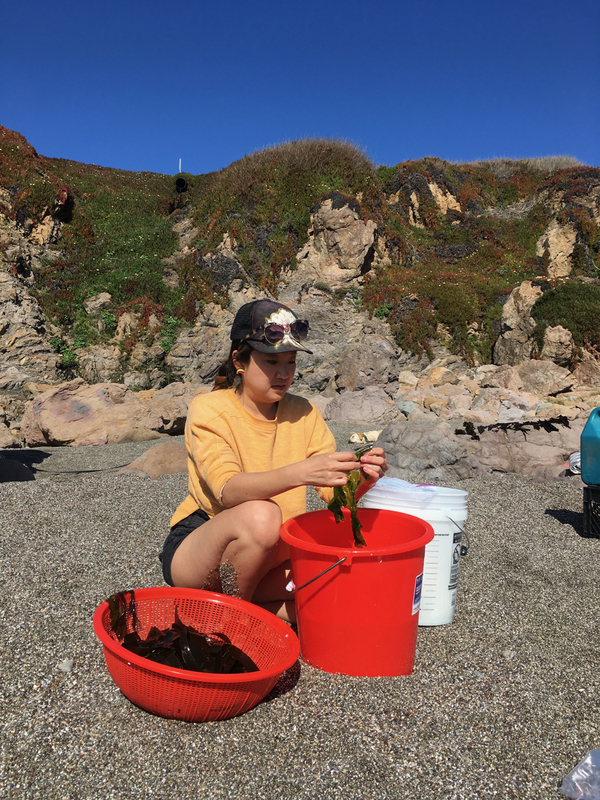 Seaside to Table: Foraging and Cooking Nori Chips! There’s plenty of reasons to take a trip to the oceanside when you’re in California. Whether you enjoy swimming, sunbathing, beach volleyball, or the relaxing sounds and aroma of the sea, a trip to the coast is always a good time. However, have you ever considered spending a day at the water foraging for native nori seaweed? This turns a fun day outside by the water into a productive one as well. That’s right, the California coast has several types of edible seaweed just ripe for the picking. The concept of eating the slimy seaweed from the ocean might seem strange at first, but there are tons of simple nori seaweed home recipes that will leave you wanting more. It’s not just the taste, though, that makes nori a plant worth diving into the ocean for; it’s also packed with nutrition! Nori is an excellent source of iodine, B12, potassium, protein, and fiber. Not only that, but it’s very low in both calories and saturated fat, making it a true super food. Other nutrients in nori worth mentioning include magnesium, phosphorus, vitamin C, and calcium. Harvesting your own nori is both fun and satisfying, but it’s important to be careful and stay aware. You’ll often spot some nori near slippery rocks, so don’t let the excitement compromise your awareness on your quest for edible seaweed. Make sure you take it slow, wear the proper gear, and cherry-pick the best and safest places to forage your nori. Once you bring your haul back home, take time to properly clean the seaweed before beginning the cooking process. As you can see, it doesn’t take much to make a delicious snack with your nori. All you need is some olive oil and salt, and in a few minutes, you’ve got delicious guilt-free chips to munch on. What beats a salty, crunchy, and healthy snack? Plus they taste even better when you harvest and cook the nori yourself! Get Creative with your Nori Chips! If you want to spice up your nori chips a bit, sesame seeds are a great addition to the recipe listed above. You can sprinkle some soy sauce over them, add a bit of spice, and more! Sure, making nori chips is quick and easy, but that doesn’t mean there aren’t a ton of small changes you can make to keep your nori chips new and exciting. It’s a great snack to experiment with, as there are plenty of different compatible flavor combinations. 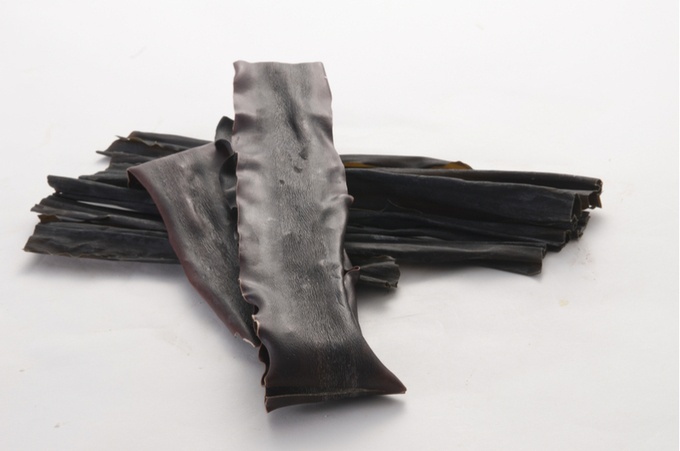 Bullwhip Kelp: The Seaweed You Can Pickle! 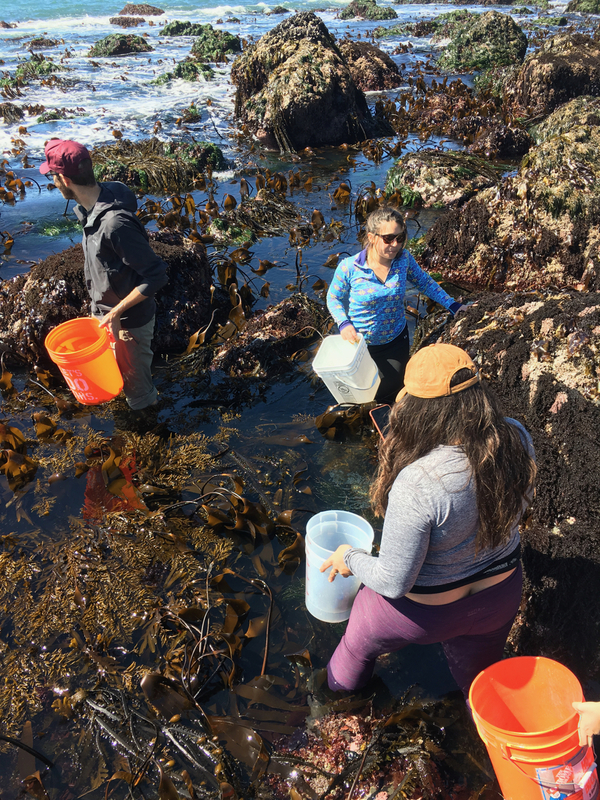 When you think of foraging for edible native plants in California, seaweed probably isn’t the first thing that comes to mind. However, the truth is that California’s coast has several tasty and healthy types of seaweed that can be easily harvested. Bullwhip kelp, for example, is high in protein and dietary fiber and contains nutrients like potassium, magnesium, iodine, and more. You can usually find it washed up on the beach after a big storm. To tell if its fresh, pick it up and bend it, if it snaps, its good to eat, if not, keep looking. It can be harvested in both the spring and the summer. Bring a knife and plastic or mesh bag, so you can cut the choicest bits. 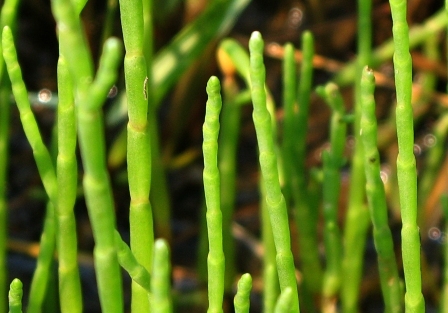 Both the stipe (stalk), and blades (flowing fronds on the top), can be eaten. For the stipe you’ll want to peel off the outer layer, I find a regular veggie peeler does the trick. 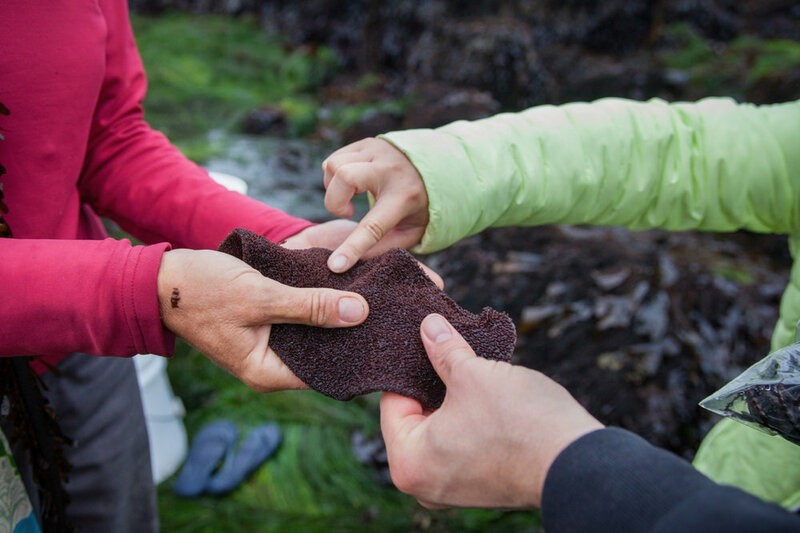 That’s one of the great things about harvesting seaweed — once you find some, you find a lot. Therefore, keep your eyes peeled for seaweed on the surface of the water so you know where to begin harvesting. It’s best to collect in areas that seem clean and do not have a lot of pollutants. Since bullwhip kelp forests are so dense, it’s easy to take far more than you can use. 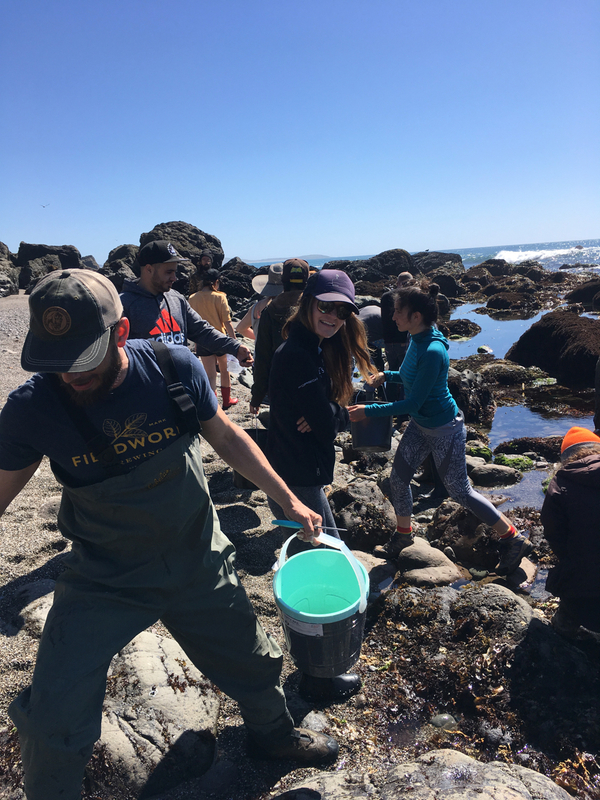 Plus, you’ll need to process the bullwhip kelp within the first day or two of harvest, so make sure you’re ready to prepare it right away to limit waste. 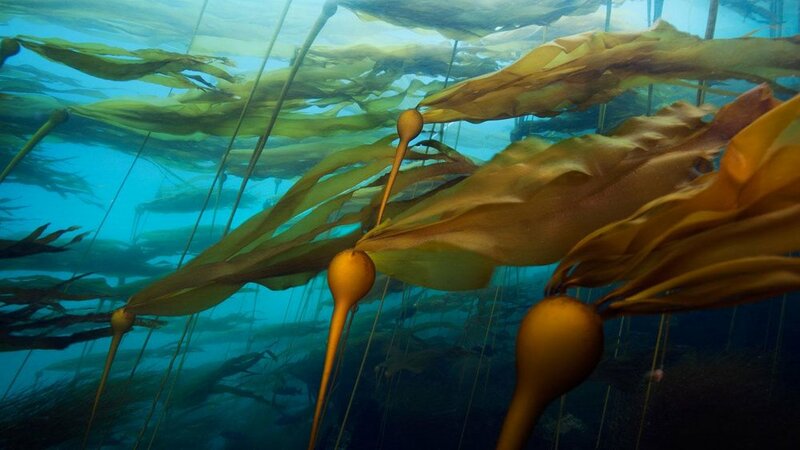 When choosing which kelp to harvest, beware of any white spots, beaten up edges, or if the texture is not smooth to the touch. These attributes indicate that the kelp is too old for good eating. 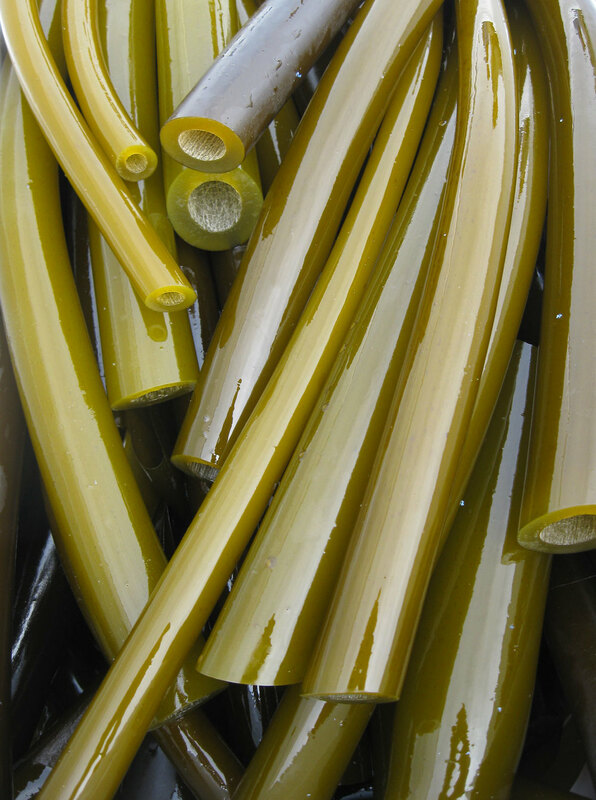 Bullwhip kelp is an interesting seaweed with bulbs, stipes (stems), and blades (leaves). Each part can be eaten. The bulbs and stipes, for example, can be pickled, while the blades can be dried into chips and added to soups and other meals. If the kelp looks like it should be rinsed off before you start, make sure you do it with sea water rather than fresh water if you can. but fresh is fine too.. First peel the outer layer off the stipe with your veggie peeler, and cut the bulbs and stipes into roughly ¼ inch pieces. Place the desired amount in a mason jar and add a clove of garlic, cayenne pepper, and a sprig of dill in there with it. Next, heat up the vinegar, water, alum/grape leaves, and pickling salt. Once it starts to boil, pour the brine into the mason jars. Sanitize the lid, and then put the cap on and wait for it to pickle! 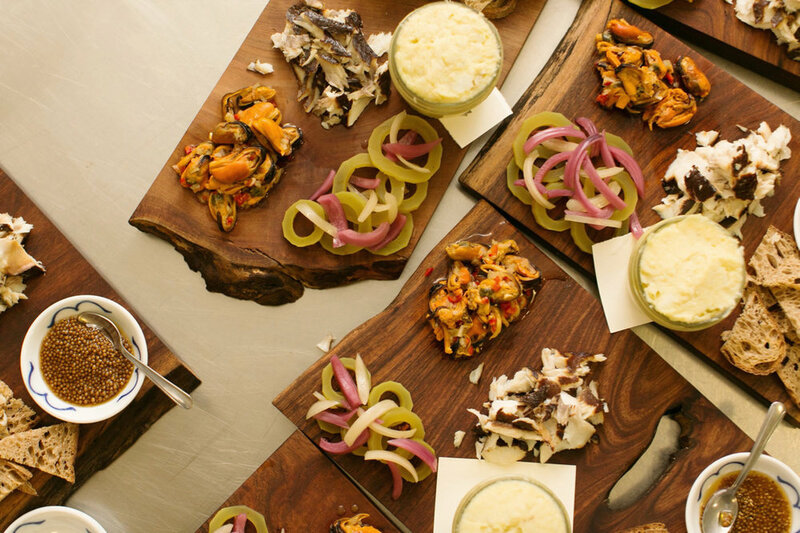 Pickled kelp is both delicious and versatile. You can basically use it anytime you would use a pickle. Whether you put it in sandwiches, make your own relish, or eat it on its own, there are plenty of ways to enjoy pickled bullwhip kelp. 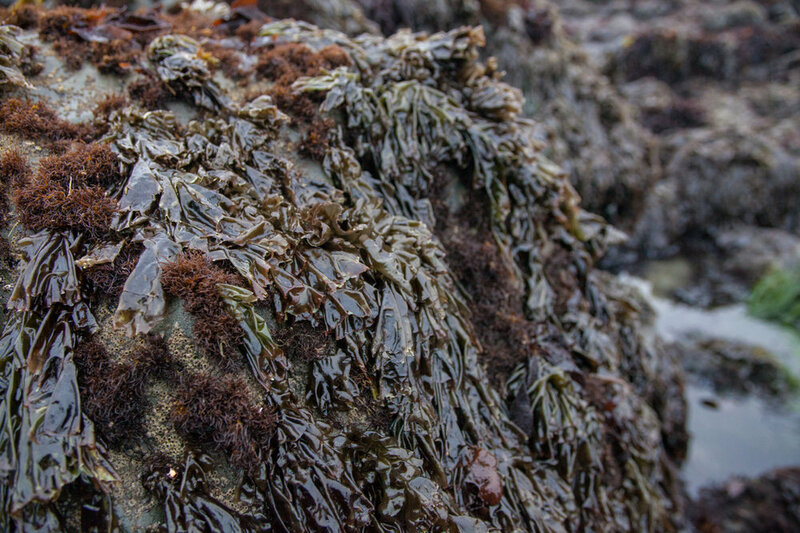 Once you add this nutritious seaweed to your diet, you’ll likely make foraging on the coast a fun part of your spring and summer routine. Why pickle seaweed, of all things? Many things are easier to pickle, and they taste better. I like pickled beets, kohlrabi, dilly beans, corn, radishes, grapes, and even turnips, better than pickled seaweed. Pickled cauliflower, on the other hand, just tastes like raw veggies with vinegar. For some reason, they're not quite right. All these pickles are delicious, and what most of them have in common is that they don’t remind me of anything else. They don’t take me anywhere except to the flavors I'm tasting. Are they good or are they bad? That’s all there is to consider. If it's done right, pickled seaweed transports you to the sea. It takes you up Highway One on the kind of drive where you pull over near the cliffs every ten minutes because it’s just too amazingly beautiful to resist. It takes you back to the first time you went surfing or took a family vacation to the coast. Seaweed doesn’t taste like a vegetable; it tastes like the sea. It's the distilled essence of ocean and sand and abalone diving, and whisky passed around a late-night campfire on a beach on the Lost Coast. That’s why I make seaweed pickles. I use bullwhip kelp, which is commonly found in this region. Seaweed provides many trace minerals you won’t get anywhere else. You can find bullwhip kelp on the beach after a storm. Bend it. If it snaps cleanly, it's fresh; if it bends, toss it. A fun way to source it fresh is to dive for it and cut it yourself. I usually grab some when I’m abalone diving. I've kept this recipe simple, in order to let the briny seaweed flavor shine through. First, get your brine a boilin’. Mix the above ingredients and bring to a boil. Rinse the seaweed with cold water. Cut off and reserve the blades (the feathery top parts), then peel the stipe. Slice the stipe (long part) and the bulb (top part) into quarter-inch rings. Place the reserved blades and seaweed rings in separate containers. Pour the hot pickling liquid over them. Let them cool, then put them in the fridge. They'll be good for three months. These pickles feature on our Seaside Charcuterie platter, along with a rotating cast of the following: Black cod brandade, pickled wild mussels, pickled mustard seeds, pickled herring, and fried smelt. Though we've been making use of the stipe for a few years, pickling the blade is a pretty recent discovery for us. They are amazingly good, with subtle sea flavor and great texture. The stipe has a more robust texture. Enjoy! If you don’t dive for these, I hope, at the very least, you'll get your feet wet while collecting them.